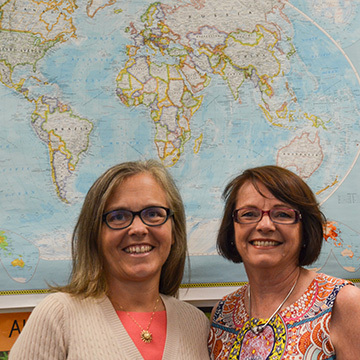 In late September, Auburn’s College of Education welcomed Jennifer Parke, a school principal from Newcastle, Australia, who was here as part of the LEAP Program. LEAP is an international leadership program that connects school leaders from around the world in a collaborative peer shadowing and shared action-research experience. The innovative, popular, and very effective program allows school leaders around the planet to share and learn from each other in a way never before possible. Parke was hosted in Auburn by Lisa Kensler, an Associate Professor in the College’s Department of Educational Foundations, Leadership, and Technology. She spent time in Auburn and Opelika City Schools both with principals and in the central office, and was also able to visit the Ron Clark Academy. Ron Clark, of course, had visited the College just 12 months earlier in a riveting presentation about the importance of passionate, inspired teachers for our nation’s children. Parke’s New South Wales (NSW) school has much in common with the schools she visited here in East Alabama. Parke has previously been a LEAP Fellow in Ontario, but very much wanted to build a relationship with educators from Alabama. She knew about Auburn because LEAP founders had a relationship with former Dean Fran Kochan of the College of Education. Parke mentioned her interest in the strong community-university partnership. She also noted the way Auburn University encouraged leaders of Auburn City Schools to look at professional opportunities that can support 21st learning and thinking – much in the same way the Ron Clark Academy is looking beyond traditional ‘drill and grill’ teaching methods to improve student outcomes. Parke pointed out that there is also value in the very notion of cultural exchange. Parke said she and her family fell in love with our community. But Parke also saw something she felt needed changing.